Please click here to access a pdf document of the full schedule. 5:00 – 7:00 pm Opening Reception in the Crosby Conference Room at the Walker Art Center. The Walker galleries will be open until 10:00 pm in celebration of their 75th Anniversary. Saturday and Sunday activities will all take place at the Minneapolis Institute of Arts (MIA). There are several pay parking lots available on 3rd Avenue South, however free all-day on street parking is available on the North side of West 24th Street and on Stevens Avenue South. 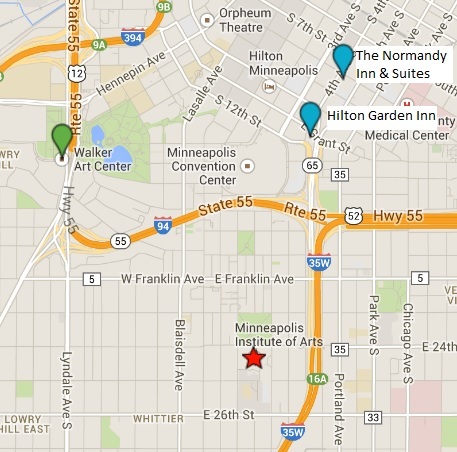 The MIA is located one mile south of the conference hotels on 3rd Avenue. We regret that we are unable to provide coffee or snacks during the morning breaks; however, Dogwood coffee is available at the MIA starting at 10:00 on Saturday and 11:00 on Sunday. Our room blocks have expired. However, we are still eligible for a group discount at the Best Western for as long as there are rooms available. The rates are confirmed for up to two people per room, additional guests are charged an additional $10.00 per night/per person. Room rates also do not include state and local taxes, presently at 13.4%. Please refer to the MRCG Annual Meeting when making your reservations to receive the group rate.